With all the leaks of the new Cult Mechanicus, we got a good look at the models and some of the rules that are coming out within the next months. 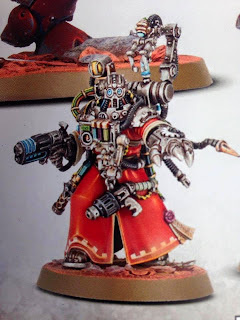 I was worried that I might have jumped the gun making the commitment to the Skitarii but after seeing the options I think I made the right choice. 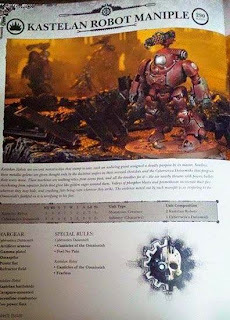 Looking at the range it looks like they are going to have an HQ, troops, and either 2 heavy support, 2 elites, or one of each. First off people don't have to freak out about not having an HQ. They can be an ally detacment and a combined arms detachmentand all is right in the world. With that being said I am not sold on the old man look of this guy. The troops, eletro priest, just do not sit well with me. 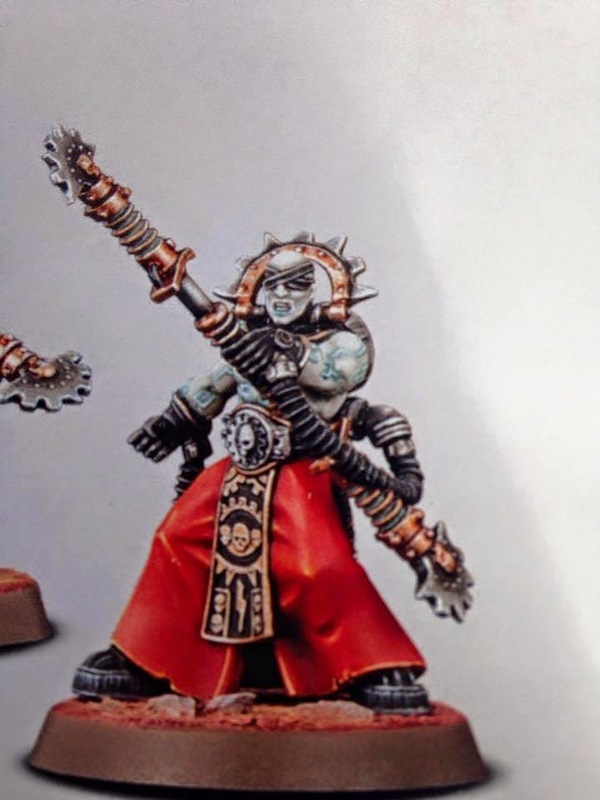 They remind me of the old Necron Pariahs. I just do not like the bare chested dudes running around. I would hate having to use these guys as troops no matter how good their rules are. This brings us to the two heavy support looking troops. The servitors and the robots. The look of the servitors is awesome. I love the treads on the mostly machine weapon platforms. I am not sure what their rules are going to be but I am sad I am not going to be getting any of these. This leaves the Robots. I agree with most of the comments I hear that they look like Baymax. I also think they look like the Biodroid from Macross: Southrn Cross. Either way I like them. Yes the head could use a upgrade (just like the riptide), but over all they are just fine. Their rules are pretty neat as well. A lot of S6 AP3 shooting is pretty strong. That alone is cool but throw in the special rules like double shots or feel no pain and you got a winner. I feel a lot of people will be running these. The robots controller. He does look cool. 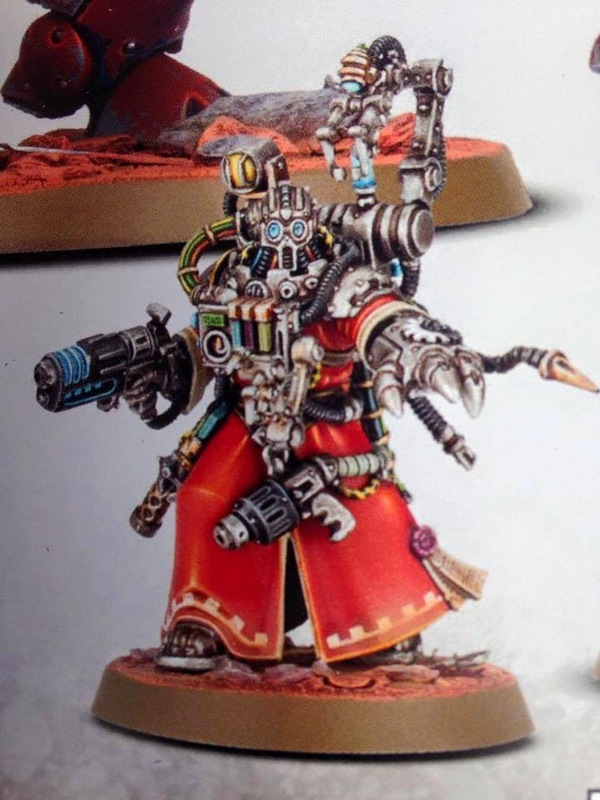 Over all, while the choices are few, I think like the Skitarii and Harlequins they could make a viable selection. I am both happy and sad that there were no transports in the book. 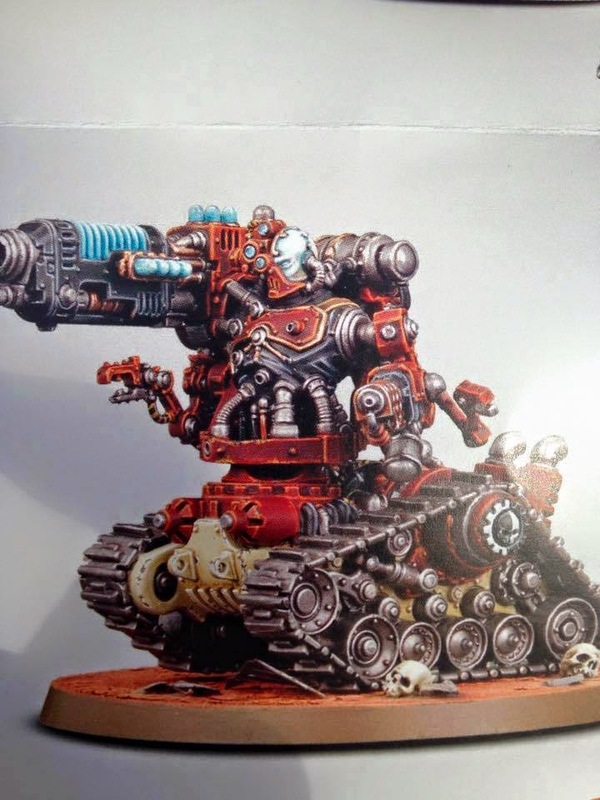 I was happy because I won't have to get 2 diferent codecies just so my Skitarii can ride in a metal box. If I do I will grab some guard and bring some vendettas or chimeras. While I doubt I will ever do it, Using some Blood Angels Drop pods or the Space Wolf Flyer might be cool but those are not even close to be in budget. So, unless someone just hands those things to me I doubt they will ever be in my collection. 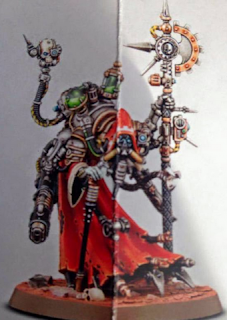 I will continue with my Skitarii. They look cool and they seem to be quite different than my normal armies. Maybe someday they will get some jeeps or hovercrafts of their own. Until then we hoof it. Questions? Comments? 01101001 01101110 01110001 01110101 01101001 01110010 01101001 01100101 01110011? WIP: Grot tanks - Filling out the ranks! Last of the Cult Mechanicus rumors.